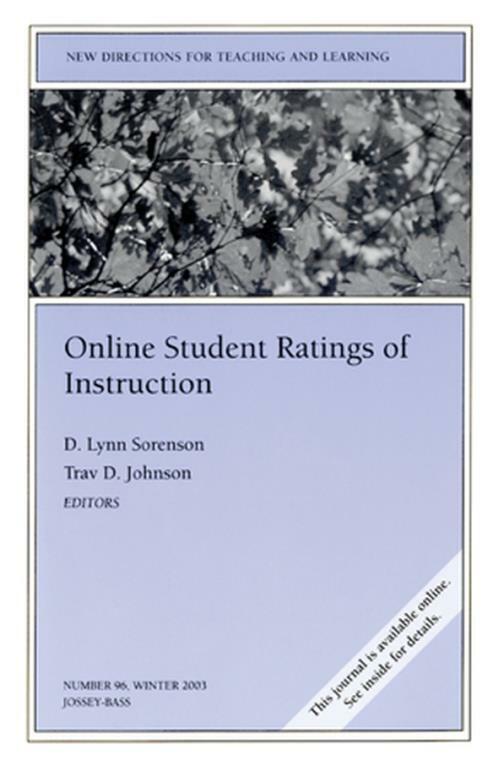 This volume examines the development and growing use of online student ratings and the potential impact online rating systems will have on the future of students evaluations of teaching. The contributors demonstrate how the preference for online evaluation is growing, even amidst challenges and doubt. Sharing their first–hand experience as researchers and administrators of online systems, they explore major concerns regarding online student ratings and suggest possible solutions. D. Lynn Sorenson and Christian M. Reiner review existing online–rating systems that have been developed independently across the globe. Kevin Hoffman presents the results of a national survey that tracks the increased use of the Internet for student ratings of instruction. At Northwestern University, Nedra Hardy demonstrates how ongoing research about online student evaluations is helping to dispel common misperceptions. Application of online rating systems can present institutions with new challenges and obligations. Trav D. Johnson details a case study based on five years of research in the response rates for one university s online evaluation system and suggests strategies to increase student participation. Reviewing online reporting of results of online student ratings, Donna C. Llewellyn explores the emerging issues of security, logistics, and confidentiality. Other chapters explore existing online systems, highlighting their potential benefits for institution and instructor alike. Beatrice Tucker, Sue Jones, Lean Straker, and Joan Cole analyze Course Evaluation on the Web (CEW), a comprehensive online system for instructional feedback and improvement. Cheryl Davis Bullock reviews the Evaluation Online (EON) system and its successful role in facilitating midcourse student feedback. The fate of online rating may rest in the unique advantages it may or may not have over traditional ratings systems. Debbie E. McGhee and Nana Lowell compare online and paper–based methods through mean ratings, inter–rater reliabilities and factor structure of items. Comparing systems from another angle, Timothy W. Bothell and Tom Henderson examine the fiscal costs and benefits of implementing an online evaluation system over paper–based systems. Finally, Christina Ballantyne considers the prominent issues and thought–provoking ideas for the future of online student ratings raised in this volume. Together, the contributors bring insight and understanding to the processes involved in researching and initiating innovations in online–rating systems. This is the 96th issues of the quarterly journal New Directions for Teaching and Learning. 1. Charting the Uncharted Seas of Online Student Ratings of Instruction 1D. Lynn Sorenson, Christian ReinerIslands of online–rating systems are sprinkled across the globe. Separated by uncharted seas, most have arisen independently without the benefit of other innovators′ "maps." In facilitating discussion among these "early adopters," the authors preview Web–based evaluation issues to provide a navigation tool for explorers of online student ratings. 2. Online Course Evaluation and Reporting in Higher Education 25Kevin M. HoffmanResults of a national survey indicate an increase in the use of the Internet for student ratings of instruction. 3. Online Ratings: Fact and Fiction 31Nedra HardyAdministrators, faculty, and students sometimes express reservations about online student ratings. At Northwestern University, ongoing research about online student evaluations has helped dispel some common (mis)perceptions. 4. Psychometric Properties of Student Ratings of Instruction in Online and On–Campus Courses 39Debbie E. McGhee, Nana LowellTo compare online and paper–based methods of student ratings of instruction, researchers examine mean ratings, inter–rater reliabilities, and factor structure of items. 5. Online Student Ratings: Will Students Respond? 49Trav D. JohnsonBased on five years of research, a case study focuses on the response rates for one university′s online evaluation system. The author identifies factors that influence response rates and suggests strategies to increase student participation. 6. Online Reporting of Results of Online Student Ratings 61Donna C. LlewellynWhen examining the merits of online reporting of student–rating results, universities must consider security, logistics, confidentiality, and other important issues. 7. Do Online Ratings of Instruction Make $ense? 69Timothy W. Bothell, Tom HendersonIn comparing online and paper–based systems, institutions need to consider development costs, operating costs, and miscellaneous costs. In a case study, researchers found that an online student evaluation system was less expensive than a traditional paper–based system. 8. Course Evaluation on the Web: Facilitating Student and Teacher Reflection to Improve Learning 81Beatrice Tucker, Sue Jones, Leon Straker, Joan ColeCourse Evaluation on the Web (CEW) is a comprehensive online system for instructional feedback and improvement. CEW promotes reflection and cooperation among faculty, students, and administrators. 9. Online Collection of Midterm Student Feedback 95Cheryl Davis BullockAn online evaluation system offers an opportunity for collecting midcourse student feedback. The Evaluation Online (EON) system provides both flexibility and structure for midcourse formative evaluation. This chapter presents faculty opinions and suggestions for the online midterm feedback system. 10. Online Evaluations of Teaching: An Examination of Current Practice and Considerations for the Future 103Christina BallantyneThe author considers prominent issues raised in this volume and thought–provoking ideas for the future of online student ratings.